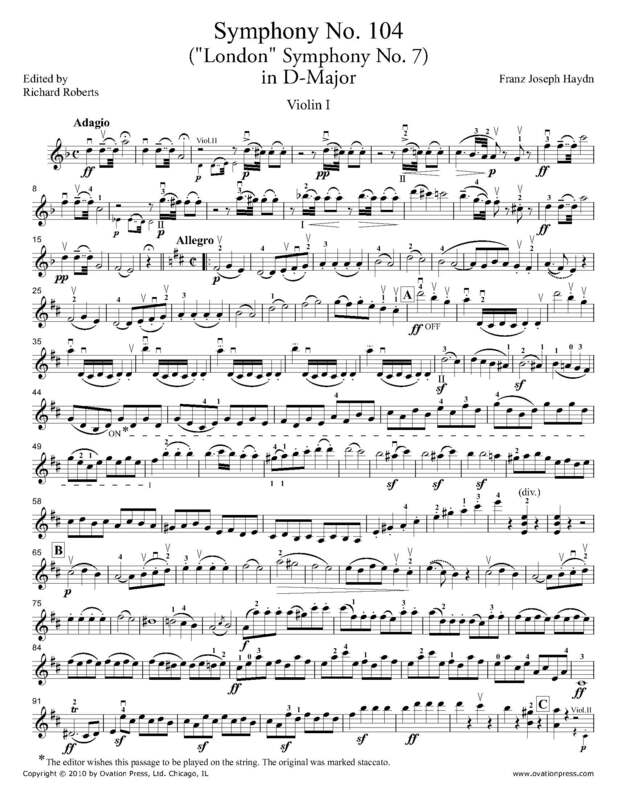 The first violin part for Haydn's Symphony No. 104 in D major, H. 1/104 has been edited by Richard Roberts, concertmaster of the Montreal Symphony Orchestra. Roberts' bowings, fingerings and other editorial markings have been added throughout the score. Symphony No. 104 is Joseph Haydn's final symphony and the last of the twelve "London Symphonies." It opens with a slow and grand introduction in D minor, leading to the first movement proper in the symphony's primary major key. The second, in the subdominant of G major, is Andante with the main theme featured in the strings and later in wind instruments. Next the symphony returns to D major for a minuet and trio before reaching the finale, a fast sonata form movement in the mode of folk music and using a theme often claimed to have originated as a Croatian folk song. Download and print the score today to gain access to expertly edited Haydn Symphony No. 104 violin fingerings and bowings from Richard Roberts!